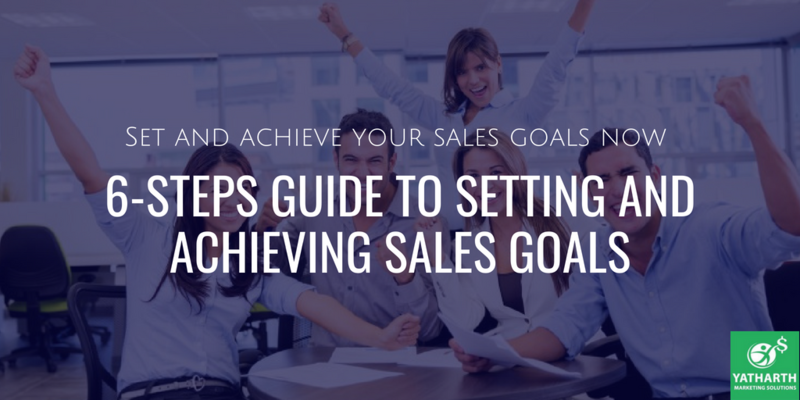 Achieving goals in sales field are not that tough (it’s not that easy as well). However, right approach and your best efforts are mandatory to meet them. If you do not have a clear goal, probably you will lose the momentum, and thus you may fail drastically. In the last few years, I’ve seen many sales executives planning goals, actions and commitment, but still, they fail to succeed. The reason is “Unclear Goal.” A clear goal helps to know where actually the respective person is headed, so following any path they will get there for sure. A salesperson with defined goals usually knows where he is headed and commits to proper goal routine. People with define goals understand where they need to go and which path is made for them to follow and achieve the respective goals. So, if you’re struggling with your sales goals and want to set and achieve sales goals this year, here we will help you. Today we will let you know how to set your goals and define strategies to meet them positively. Start your day by reviewing all your sales goals in the morning until you achieve it. Once you review your sales goals, scan your weekly schedule and define the actions that need to be performed on that particular day. Lastly, evaluate how your day was? Was it successful? Were the achievements of the day satisfactory? Define goals and actions for the next day concerning results of your present day. On weekends, either Saturday or Sunday or both, sit calmly and analyze sales goals achievements of the present week/previous weeks, and then find out the areas that need improvement. Keep the review results in mind and by that define set of goals and actions that need to be performed in the coming week. Include it in your weekend routine and discuss the ending week results with your sales goals partner. Anyone can be your goals partner, a mentor, a peer, a coach or even your friend. A goals partner is someone you explicitly work with on weekends to ensure that you’re on the right path to achieve your sales goals. Along with goals, achievements, and progress, you should also discuss drawback factors with your goals partner that are not allowing you to succeed and achieve goals. These drawbacks can be any problems, potholes, etc. Try to meet groups of people, neither that big nor too small group, and discuss your ending month achievements and journey with them. Explore everything, review your progress. Let them judge you what you’re doing, what are your weak points, what are sales elements that need attention and improvements. Ask them for ideas to make things perfect and how to get rid of factors that are drawing you back. Keep reviewing your progress towards annual goals quarterly. Don’t set several priorities, they can make things complex, and you will not be able to focus appropriately. Set maximum three quarterly goals and give your best to achieve them on or before the deadline. It will help you to stay more focused towards annual goals, and things will remain on track. While reviewing your quarterly progress report, define goals for the next three months and how you will achieve them. Question yourself, most of the time best answers remains within you. Don’t forget to set next annual goals yearly. Ask yourself what do you need to set big-picture goals. Once you’re done with your goals and strategies, ask yourself whether you’re satisfied with them, Will they help you to achieve big-picture goals? Make sure you analyze your goals and plan before you start working on them. It will help you to end up with satisfactory results. Never Give Up: It’s not that easy to succeed with goals in the sales field. You will have to face ups and downs. So never give up, learn from your mistakes. Competition is at its extreme: Competition in sales field is at its extreme. Thus, you will have to present yourself strongly and actively to firms and buyers. That’s something you can do with expertise skills and experience. You will gain the experience with time, and to sharpen your skills as a newbie, you can enroll yourself in sales training programs. Sales training program works the best and offer great sales market exposure, strategy, and skills. So that’s how you can set and achieve your sales goals positively. Never give up, stay motivated and energetic, these are the three elements to succeed in the sales field. Just define right goals, follow right path with proper strategies and approach to target market creatively, that’s it. You will be flying really high in the sky of sales market soon. Thanks for reading this post. Hope it has delivered some valuable information to you and motivated and guided you to do really well in future.